Since I carelessly touched Miki Ando’s artistry in the last post, it’s got me thinking of the disturbing questions about artistry on ice. Now I’d like to write about this complicated topic from my view, as an amateur figure skating fan, taking Miki for examples. I'll start with the definition of artistry on ice. Two items contained within PC (Program Component, frequently referred as five component score, see Appendix at the end of the post) judges the artistry that’s what we imagine: Performance/Execution and Interpretation. The former evaluates how good a skater physically, emotionally and intellectually translates the intent of the music and choreography, and the latter evaluates the personal and creative translation of the music to movement on ice. My criterion of artistry is simple. That is whether I find a performance impressive or not. While viewing performances, I rarely think of the components. Only when I feel there is something wrong with scores, I reinterpret my impression in the light of the items afterward. Some examples follow. Needless to say, they are excellent skaters with high technical skills, but no matter how judges repeatedly try to convince me of this couple’s artistry, it doesn't mean very much to me. The reasons are different here. As for the woman, yes, she translated something very well. But, her acting, posing, and facial expressions didn’t move me at least in the last season. It’s just a matter of preference. That’s all. On the other hand, as for the man, I think he’s not gifted as a performing artist (sorry, it’s my view). It may be that he’s not good at expressing the intent through movements or …. He looks like a monotonous skating machine and moving regardless of the music. Unfortunately, Miki Ando was often reviewed for poor artistry. Frankly speaking, I don’t think she’s a gifted artist, and I didn’t like her movements of arms and droopy posture. Until the last season, I didn’t esteem her for the artistry, but now I think she’s stateliness and expresses her passion statically to the music. It may be difficult for people all over the world to read out that. I have to admit it’s not that someone denying her artistry because they don’t have an eye. I don’t agree several points of judging system; it seems to me that PC is an Aladdin's lamp along with -3 to +3 GOE, grade of execution that is given to each element (jumps, spins, and so on). Overall skating quality: edge control and flow over the ice surface demonstrated by a command of the skating vocabulary (edges, steps, turns, etc. ), the clarity of technique and use of effortless power to accelerate and vary speed. The varied and/or intricate footwork, positions, movements and holds that link all elements. In singles, pairs and synchronized, this also includes the entrances and exits of technical elements. Performance is the involvement of the skater/couple/teams physically, emotionally and intellectually as they translate the intent of the music and choreography. Execution is the quality of movement and precision in delivery. 4. 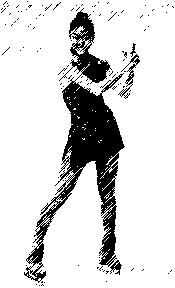 Choreography (振り付け) nothing to do with a skater’s ability, isn’t it? An intentional, developed and/or original arrangement of all types of movements according to the principles of proportion, unity, space, pattern, structure and phrasing. The personal and creative translation of the music to movement on ice. I had another day of figure skating on Sunday. I watched live coverage of Ladies’ FP in the afternoon and that of Exhibition(群星會表演 in Chinese) in the evening via streaming TV. Even though Miki Ando wasn’t in good condition, she performed well enough. In this season, she’s moved on to the next stage in which she can express passion for skating and execute on strategies to get points at the same time. During silly media hype of the rivalries (Mao and someone), she’s grown. If some people will still think her weak point is artistry, I'll be sorry for their poor sense of perspective. Mao performed a triple axel well enough to shatter! Even she made some mistakes on subsequent jumps, she scored high enough. She reformed her FP, and my favorite part in which she takes off running was gone…. But new version was impressive, too. In a way, Japanese skaters swept the medals! Even if you are Japanese and not a figure skating fan, I do highly recommend watching World Championships that will be held next month in Tokyo for you because we'll never have so many talented Japanese skaters at the same time again. Although I watched great performances at the competition, my highlight of the day was Midori Ito! I saw her after a long interval. She appeared in a TV quiz show, a trashy where-are-they-now show in which one asked to exhibit one's skills before retirement. She asked to perform an axel jump. She lost weight and is thinner than before. Good. She lives in Kokura, Kyusyu (the third largest island of Japan) and teaches skating to a child. Good. 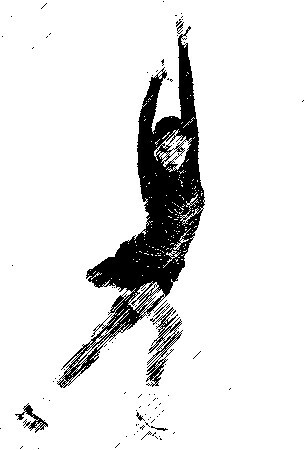 Forty-one- year-old Midori easily completed a double axel! I couldn’t find that video on YouTube yet, so I’ll show you her jumps before retirement. She was the genius of jump of all time. Just watch it. She jumped unbelievably high in that flying distance. Wonderful! I had the day of figure skating. Live coverage of Ladies’ SP was from 14:00 to 18:00, and that of Men’s FP was from 19:00 to 23:00. So, I spent all day stuck in front of the TV and watched the performances from first group. Miki Ando performed with minimum mistakes and has been first. She looks very dignified this season. Mao didn’t fall on triple axel but couldn’t control the landing. She completed triple loop, 3-2, and other elements. Good. Commentator Hideo Sugita (杉田秀男, a former male figure skater who judged ISU competitions until 2005) said, “The reason of the error on the landing might be that she messed up the timing because now she can jump longer than before. So, it’s the sign of achievements of reforming jumps.” I do hope so. It was good to see clean Flatt. Akiko Suzuki cannot perform in the World, but she seems to be going to continue her career next season. Good for her! Daisuke is a genius in recovering. He missed quad (it’s not uncommon) and then performed well. He made revisions of his program for the World, and this competition was nice opportunity to foretaste. Kozuka also missed quad but made minimum mistakes after that. It’s really good for him because he tended to melt down after failed quad until last season. I like Abbott’s FP and wish I could watch it in Tokyo next month. I was moved by his performance tonight though he fell on quad and made minor mistakes. I think I should have signed on with pay-TV that presents all skaters’ performances sooner. I found watching non-top skaters very interesting. As for first and second groups, I felt as if I watched a school recital (excuse me), but it was fun to sit back and enjoy their skating while I read and posted messages on a special thread for the live on 2channel, a Japanese Internet forum. The 2011 Four Continents Figure Skating Championships has been held in Taipei City, Taiwan from February 15th, and I watched the men's short program this afternoon via a pay-TV that broadcasts the competition live on television. So, I can enjoy it without needless FujiTV-related stresses (see a previous post). It seemed that Daisuke recovered from neck pain and is in good shape. I hope Hanyu and Armin will be able to give of their best in the free skate program. Men’s FP and Ladies’ SP will be held tomorrow. And now, for something different: last Sunday Fuji TV, one of the stupidest terrestrial stations in point of figure skating coverage, aired recorded a figure skating show, Japan Super Challenge 2011 held on January 7th in Nagoya, in which twelve skaters, including Mao Asada, Miki Ando, Daisuke Takahashi and Nobunari Oda, were divided into two teams to compete. The judges were guests and audience. One of the guests was Tesuya Kumakawa (熊川哲也, a Japanese male ballet dancer who belonged to The Royal Ballet for 10 years. ), and after Mao’s performance, Ballade No.1 by Chopin, he made remarks as follows. From her performance, I felt she really loves skating and respects Chopin. She didn’t appeal to the audience but conversed with her figure skating. I was deeply touched by that her skating style. He has such keen perception. I like a style of performance, if not all, in which one skates to the crowd because it’s enjoyable. However, I’m greatly moved only by a skater in synchronization with music, not mere superficial acting by facial expressions and posing. Yumura hot spring resort, which is made up of fourteen inns, is ten minutes away by bus from Kofu Station in Yamanashi Prefecture. 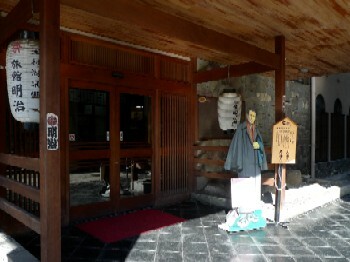 The resort has been known since ancient times. According to legend, Kobo-Daishi (弘法大師, 774 – 835), Kukai (空海, a Japanese monk who formed the Shingon school of Buddhism), found the spring. It used to be surrounded by field, but now it’s in a residential region because of urbanization. 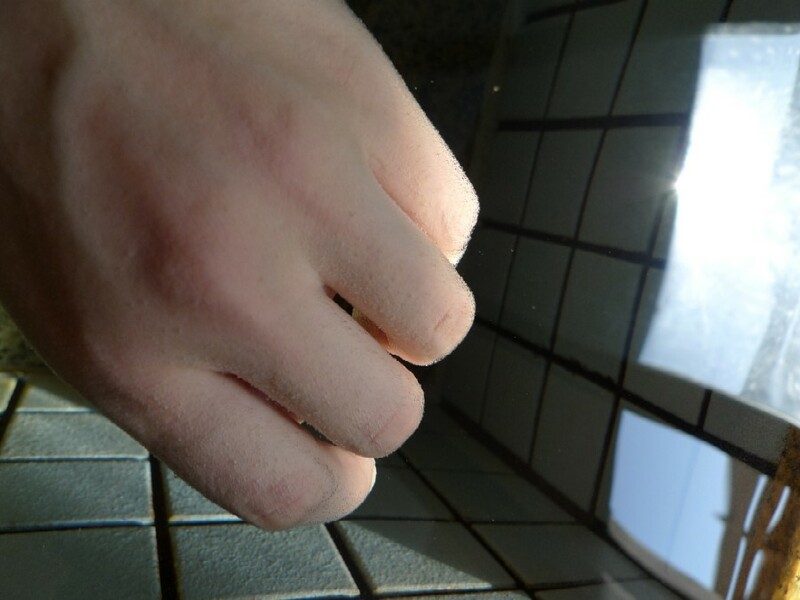 This is a Kinakinw’s hand submerged in Yumura hot spring water. According to The Yumura Spa Association’s HP, it’s sodium and calcium sulfate chloride spring (ナトリウム・カルシウム?塩化物・硫酸塩泉), not carbon dioxide spring (二酸化炭素泉). However, as you see from the picture, if you soak in the hot spring, your body will be covered in bubbles, which is the feature of spring carbon dioxide. 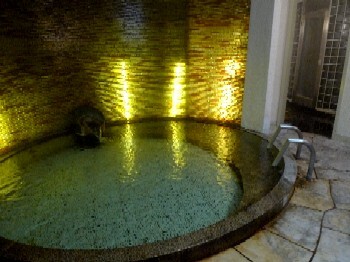 It’s also characterized by alkaline spring called Bihada-no-yu (美肌の湯, hot spring of beautiful skin) with pH of 8.4. It’s considered alkaline spring removes dead skin and makes skin smooth. Actually, when I got in it, I felt as if skin lotion coated entire my body. I mean the water was rich. 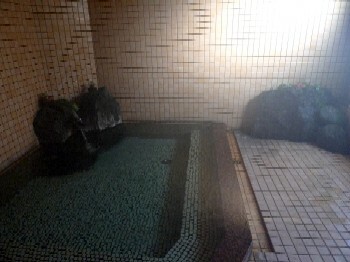 I visited 2 inns with a reputation for quality of water besides Meiji Ryokan where we stayed in. Interestingly, each had slightly different water though they were situated close to each other. Meiji Ryokan (旅館明治) It was nice alkaline water with sulfurous aroma. Hotel Ryokan (吉野ホテル) It was the richest alkaline water but didn’t smell sulfurous. Hotel Yumura B&B (湯村ホテル) It was the bubbliest and faintly smelled sulfurous. 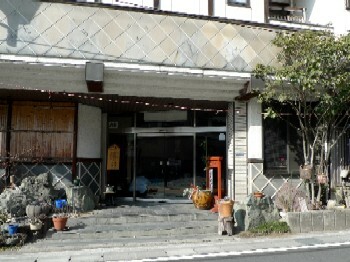 If you go to Kofu on business, stay in Yumura instead of hotels around the station. 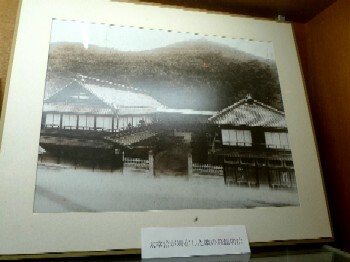 Meiji Ryokan (旅館明治, a Japanese-style hot spring inn) in which my friend and I stayed in Kofu (甲府, the capital city of Yamanashi Prefecture) is Inn of Osamu Dazai (太宰 治, 1909 – 1948), one of fiction writers representing 20th-century Japan. He is known for his ironic and gloomy wit and his obsession with suicide. Actually, he committed unsuccessful love-suicides and finally accomplished it when he was 38 years old. 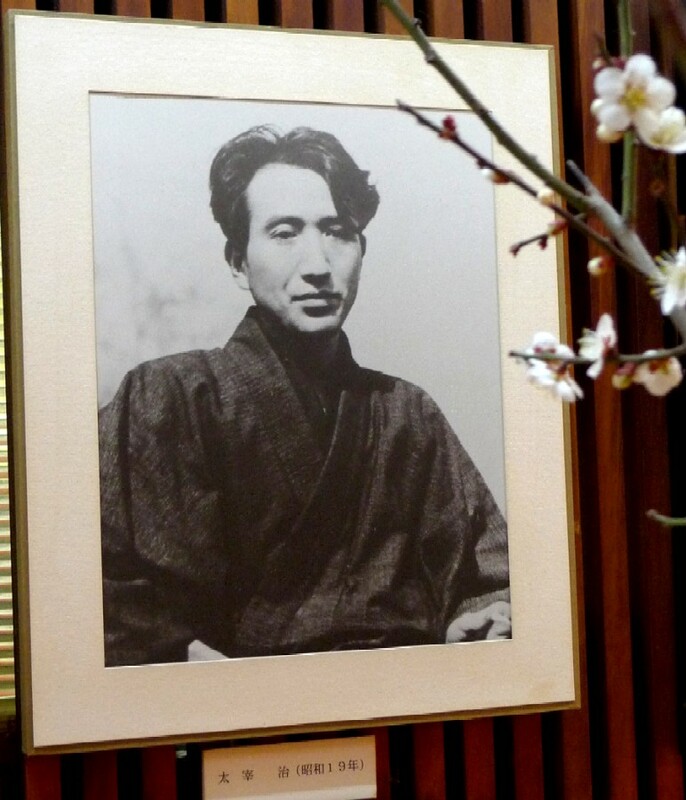 According to Meiji Ryokan’s HP, Dazai visited the inn located in Yumura hot spring resort (湯村温泉) twice in 1942 and 1943, and during his stay, he wrote Right and Smile (正義と微笑) and Minister of the Right Sanetomo(右大臣実朝) respectively. 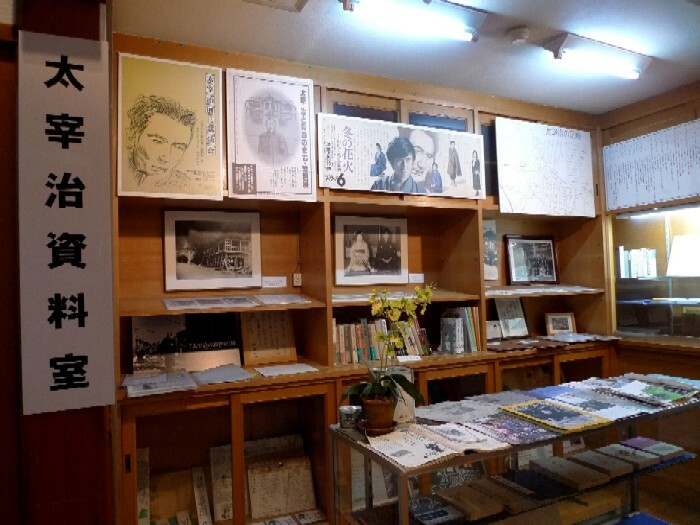 There is Dazai Museum in the corner of the lobby. 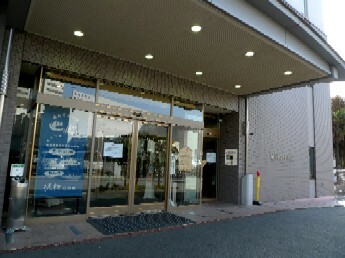 The author was connected to Kofu. When he stopped writing in 1938 because of fighting the Pabinal (a morphine-based painkiller) addiction and his third suicide attempt, Masuji Ibuse (井伏鱒二, 1898 – 1993, a Japanese author) invited him to stay in a cottage in Yamanashi (天下茶屋). 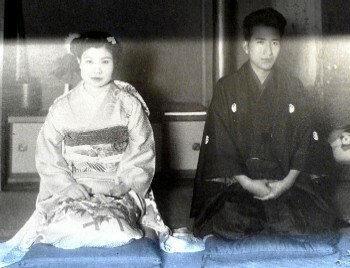 After staying in it, he married a woman from Kofu through the good offices of Ibuse. The couple peacefully lived in Kofu for a while, and he restarted writing. I found the first published edition of "No Longer Human (人間失格)" among the items on display. That is Dazai's masterpiece and one of influential books in my adolescence. He literally broke his back for the novel. The novel draws the portrait of the life of a central character, which is modeled on him, who cannot show him and instead pretends someone else to live with others. 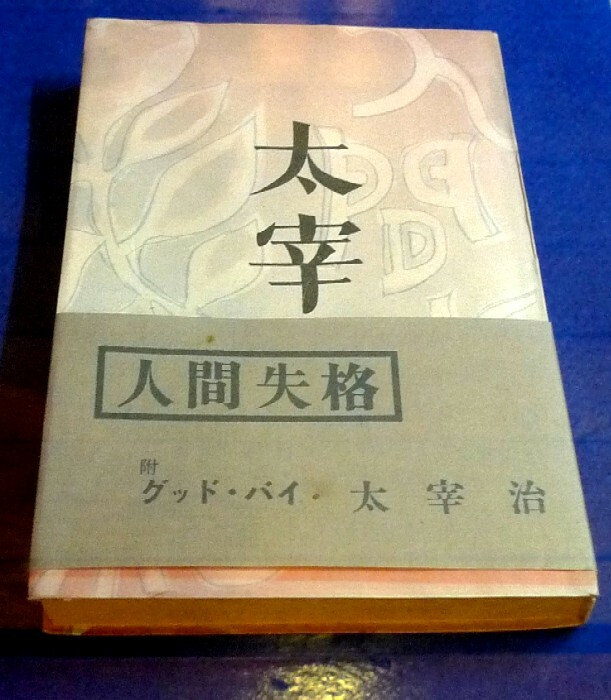 Many Dazai’s works are written from “first person” viewpoint, a style of "I Novels (私小説)", and this one (its plot is just like tracing Dazai’s life) is believed to have been his will because it was published after his death. Mine has been a life of much shame. I can’t even guess myself what it must be to live the life of human being. I was born in a village in the Northeast, and it wasn’t until I was quite big that I saw my first train. The masterpiece gave Kinakinw, as a high school girl, a soul-shaking experience. “I” in the novel reminded me of me, and I thought as if “I” were my own. I reread it in my early 20’s and had the same experience. I think my youth was quite sound. 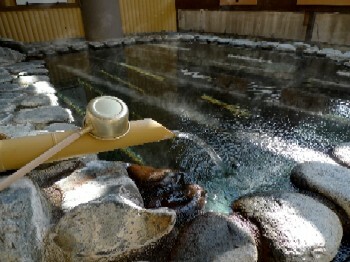 Meiji Ryokan has a genuine gensen kakenagashi (源泉掛け流し) bathtub into which pure hot spring water is poured directly. In that bathtub, I was deeply impressed by the thought of that Dazai enjoyed the same water. “The Sower (種まく人, 1850)” is one of the most well known of Millet's paintings, along with The Angelus (晩鐘1857–59, Musée d'Orsay, Paris) and The Gleaners (落穂拾い, 1857 , Musée d'Orsay, Paris). 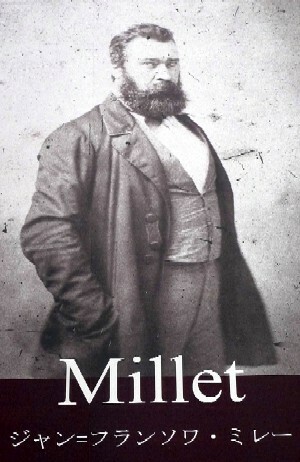 Jean-François Millet (1814 – 1875), a French painter who founded of “Barbizon school (バルビゾン派)“ with fellow painters, drew two The Sower that were the same in size and composition, and sent one of them to an exhibition. One The Sower is now in Yamanashi Prefectural Museum of Art in Kofu, the capital city of Yamanashi Prefecture that’s 100 km to the east of Tokyo. I visited to Kofu from last Wednesday to Thursday, and stopped at the museum that’s a 15-minute bus ride away from Kofu Station. Arts from the mid-19th to the former part of 20th century (e.g. impressionist school, Barbizon school, art nouveau, deco) are quite popular among Japanese, and Millet's paintings are familiar for us. I myself saw his works at museums including Musée d'Orsay and Louvre, and made a stop at Maison de Millet when I visited to Barbizon Village de Peintres. But I'm ashamed to say I hadn’t known The Sower in Yamanashi, Japan. 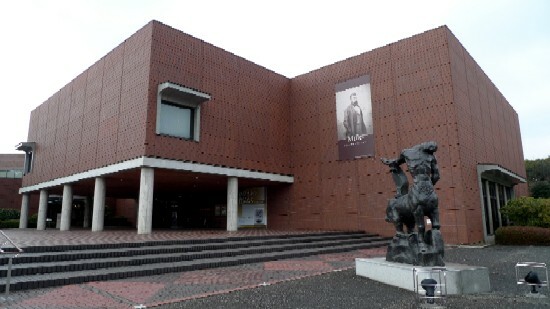 I’d say Yamanashi Prefectural Museum is a place worth visiting if you are interested in 19th-century paintings. 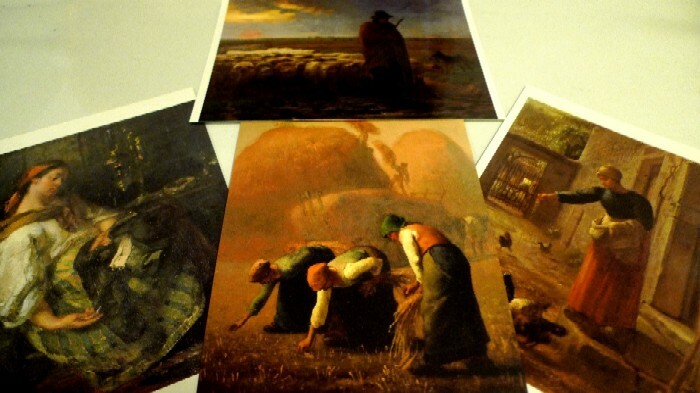 The museum is able to focus on the theme of Barbizon school because of the great piece of writing, and houses other Barbizon painters’ works (Corot, Théodore Rousseau, Dupré, Daubigny, Troyonaubigny, and Diaz) around Millet. These are collection of the museum. I spent little more than an hour to appreciate the painters’ works and thought about Barbizon Village at the moderately small museum. 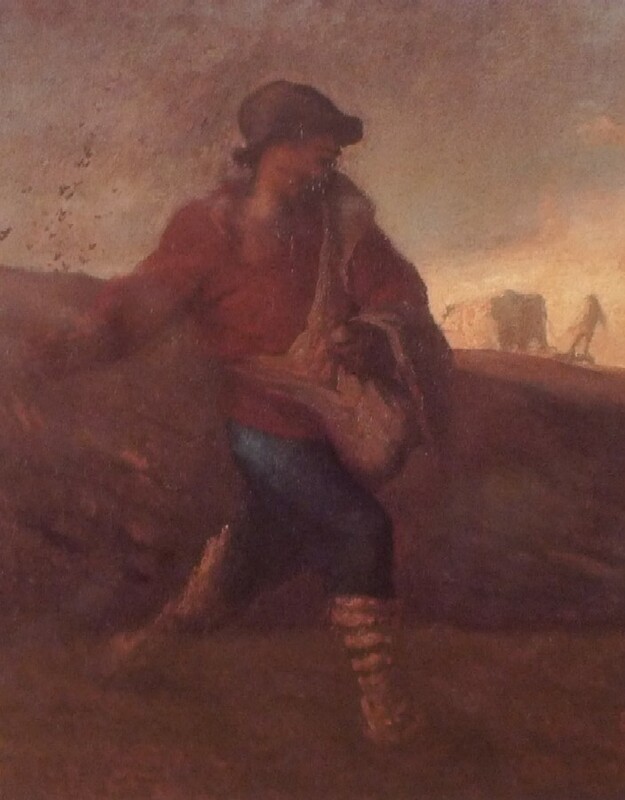 For your information, the other The Sower is in Museum of Fine Arts, Boston. 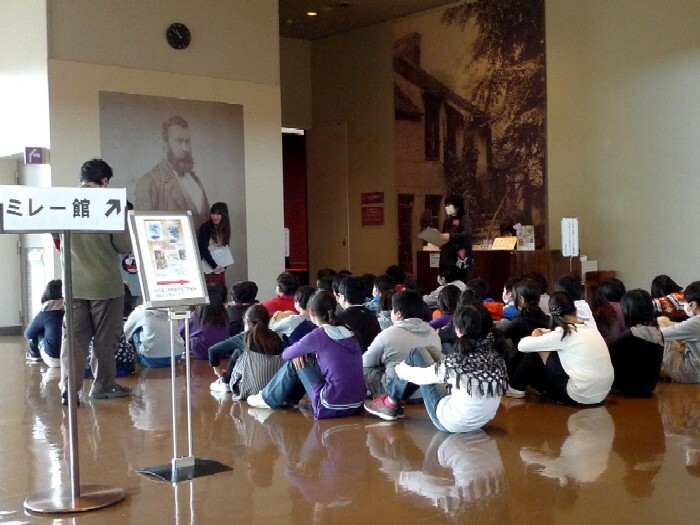 An art workshop for elementary school kids was held during my visit. 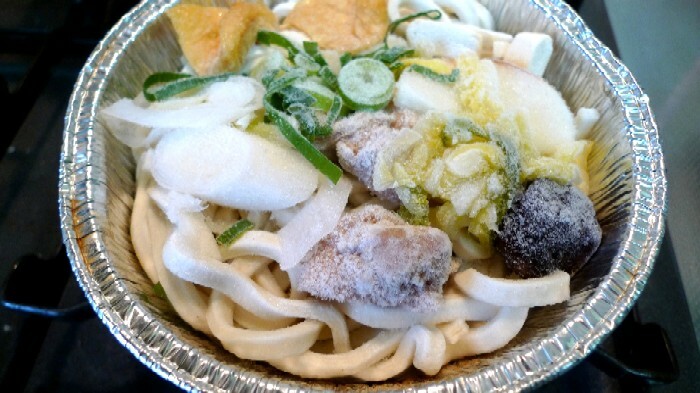 The other day in a TV show, this frozen “miso-nikomi-udon (味噌煮込みうどん)” received high praise from people who consider themselves gourmets. It’s one of products of a food company, Kinrei Corporation (株式会社キンレイ) that makes noodle for business and domestic use, and also runs restaurant chains. The company has released 28 kinds of frosted noodle for domestic use, and we can easily find them in the frozen food section of convenience stores and supermarkets. Miso-nikomi-udon is udon noodles (a type of thick wheat-flour noodle) simmered in miso-based soup and is usually served in an earthware pot. 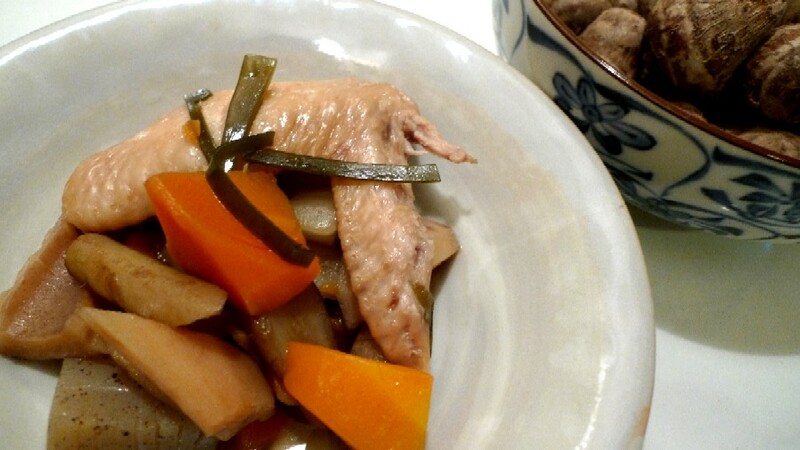 It's a local speciality in Nagoya area in Japan. 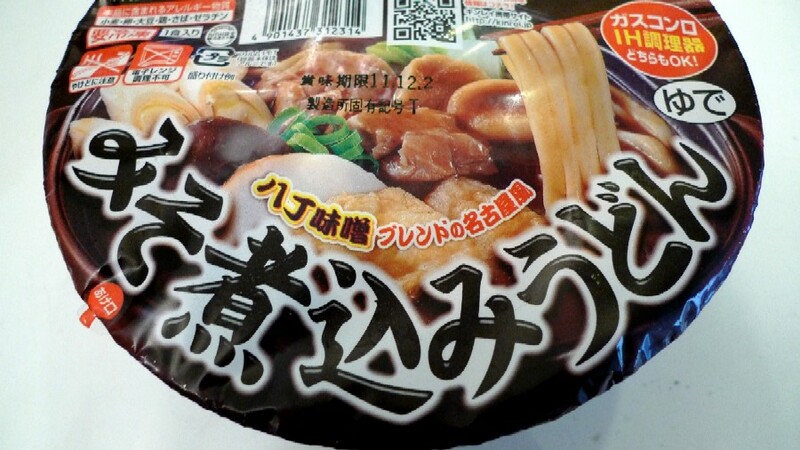 I've had some of the company’s products before (they were OK), but hadn’t miso-nikomi-udon yet. You know, never believe what you hear from TV naively. Especially in gourmet reports, there are some complications: forced comments along with scenarios, thoughtfulness for restaurants and a reporter’s sense of taste. 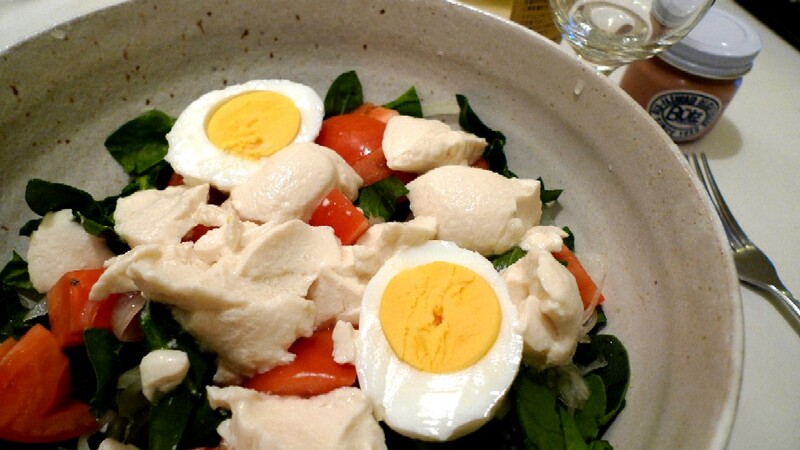 It’s prepared frozen food, and we defrost it using the stove or electric cooker, not microwave. First, heat it over low heat for 2 – 3 minutes, and then turn the heat to medium. I particularly liked its miso-based soup. It was tasty hacho-miso (八丁味, red soy bean paste made in Okazaki, Nagoya) soup. 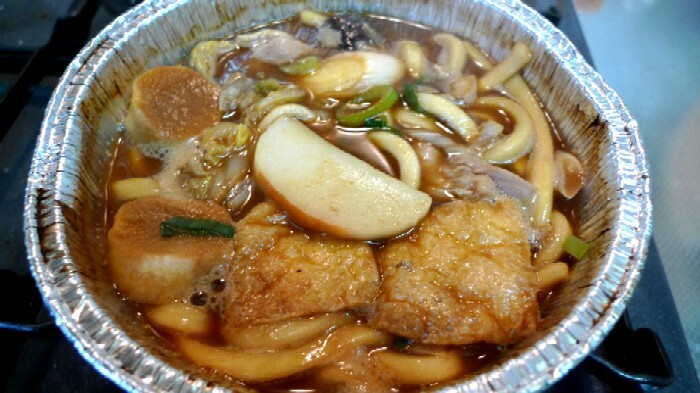 Udon and topping were OK.
Obviously, it have no chance against an established restaurant in Nagoya or a prestige restaurant in Tokyo, but even if I’m served it at a noodle shop at the corner of a street, I would feel its soup delicious. If a skilled cook prepares a meal for a customer in his or her kitchen using good cooking ingredients, it’s not surprising the meal is delicious. Considering it’s a mass-produced frozen meal and costs less than 400yen ($ 4 .5), I’d say Kinrei’s miso-nikomi-udon is worthy of praise. I think it needed corporate efforts to develop the product under constraints. It’s a just a frozen meal in a refrigeration case, but it tells an important thing for us. This kind of efforts have (had?) been associated with Japan's international competitiveness. Freddie, Do You Mind or Not? A lot of international movie stars and musicians appear in TV commercials in Japan: currently Tommy Lee Jones recommends canned coffee, and George Clooney does nespresso. According to uncertain information, the original promotional video was processed with a computer for it. Queen has remained popular in Japan. Their songs are repeatedly featured as theme songs for TV dramas and commercials, and they have been attracting a lot of new fans in addition to old ones. I’d been familiar with the band, but I’ve started listening to their music at home and had a high regard for the vocalist after his death. However, there is a difference of opinion among Japanese Freddie fans. Some say they’re enjoying it, others say it’s insulting to make him perform in that way without his consent. I think if he is still alive, not only he’ll accept it, but also 65-year-old Freddie will sing and dance for it. He was a Japanophile. Actually, he wrote lyrics in Japanese for a song titled La Japonaise in his solo album, Barcelona. He could enjoy singing in Japanese. Freddie, too much praise is a burden…. 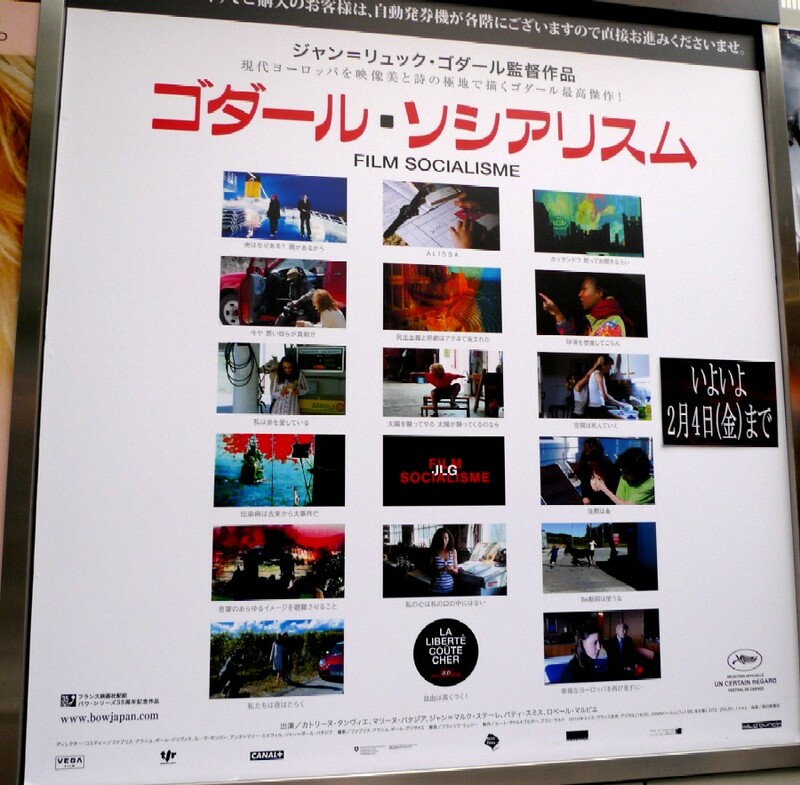 In the middle of this week, I made an unscheduled stop at a movie theater and saw “Film Socialisme (ゴダール・ソシアリスム)” directed by Jean-Luc Godard (1930 - ), the masterly French-Swiss film director. The movie will be off the screen soon. According to the film's official website, the film consists of three parts: (1) “Des choses comme ça (Such things)” is set on a cruise ship carrying a variety of characters (a photographer and his girlfriend, an aging war criminal and his granddaughter, a former United Nations official, a Russian detective, and so on), (2) “Notre Europe (Our Europe)” is a story of a family demanding serious answers on the themes of liberty, equality, and fraternity, and (3) “Nos humanités (Our humanities)" visits six places: Egypt, Palestine, Odessa, Hellas, Naples, and Barcelona (the places match ports where the cruise ship visits). I didn’t know much about the movie, but I found a time and dashed into the theater because I realized it would be a priceless opportunity to see the 80-year-old director’s feature-length movie in the first run. I’d seen his several works only by DVD and video. Then the tough movie shook me up because I felt as if my appreciation of the movie was tested. It was a flood of patched images like collage, fuzzy video footages (it was shot using HD video), multi-lingual conversations, numerous citations from other movies, philosophical dialogues, and embedded or non-existent stories. A complete picture of the story was never shown. All I could get were fragments. While I reconstructed deconstructionalistic (脱構築的) images and dialogues so that ordinary people, like me, could understand it, I also had to use what little knowledge of the modern history and geography of Europe, Middle East, and North Africa for the reconstruction. Additionally, to understand each character's background I needed to distinguish languages: French, German, Russian, English, and Arabic. So, when it finished, I got pretty tired. In a sense, this one-minute preview (a video on fast-forward of the movie!!) might be more enjoyable than the movie itself because without puzzling about the stories and theme, we can simply enjoy images. I recommend this video without hesitation. I think that a movie is inevitably viewed through the filter of anyone who watches and that any movie is open to interpretation. So, I pick up “Quo Vadis, Europe? (Where’s Europe going)”as its symbolic message. The director might ask the question that encourages viewers to think about it through money, capitalism, democracy, information, cradles of civilization, wars, civil conflicts, and massacres that the movie describes. His effort appears to succeed. I just declared the dieting practice yesterday, so you may wonder why I report it early in the next day. In fact I found that I’ve already lost 2 kilos, which is the result of dieting after New Years off. I’ll keep this dietary life for a while longer. First of all, I want to make one point clear. I’m a normal-weight woman by IBW (ideal body weight) criterion. If I get fat, I lose weight by controlling calories-in and keep my ideal weight. Actually, I have advantages over a person who is more likely to gain weight than me. Firstly, I have a family history of muscular build and a relatively high basal metabolic rate. Secondly, I don't have a habit of eating between meals. Thirdly, I like less fattening food on a regular basis. It’s enough to eat oily foods once or twice a month. A slightly fat woman whom I often meet in a nearby sauna always says I-envy-you things to me. She’s tried all dieting methods that became hot topics including dubious slimming drugs but never succeeded. Though she is a lovely person, I get tired of hearing her similar dieting stories every time. Needless to say, she didn’t accept my suggestion. While she really wants to lose weight (I think so), she doesn’t want to change her dietary habit. She loves eating. She looks happy when she talks about yummy meals. She enjoys fruitless dieting, too. My concept of dieting is reducing caloric intake toward a concrete goal, but to the lovely person, dieting is a recreational activity. When I meet her next time, she’ll certainly repeat the same conversation. She's a really nice person, though. Her heart was in the right place. Rather, the lady in my mother's age seemed happy with that and said I was thinnish, and I’m perfect now. I don’t know if I’m perfect or not, but it’s true I have gained 3 kilos in the last 3 months. I knew it ant have been going on a diet after New Years off though I just lost 0.5 kilo so far. (With apologies to the lady) I put on few kilos one or two times a year and then put weight back on again. My dieting method is simple. I just eat balanced meals (the three major nutrients, vitamins, minerals, and so on) and reduce caloric intake to less than 1,500 kilocalories per day. I try to have food that boosts my metabolism and accelerates fat combustion, but it's not in my style to eat only particular types of food or not to eat something to diet. No matter what someone says, only when calories-out exceeds calories-in, we will lose weigh. To loose one kilo of fat we have to burn 7000 kilocalories. Now it’s time to get serious with it. Then I had two slices of French bread with liver paste and a bit of risotto that day.